George Nelson studied Architecture at Yale, where he graduated in 1928. He continued his studies and received a bachelor degree in fine arts in 1931. A year later while preparing for the Paris Prize competition he won the Rome prize. With Eliot Noyes, Charles Eames and Walter B. Ford he was part of a generation of architects that found too few projects and turned successfully toward product, graphic and interior design. Based in Rome he travelled through Europe where he met a number of the modernist pioneers. A few years later he returned to the U.S.A. to devote himself to writing. Through his writing in “Pencil Points” he introduced Walter Gropius, Mies van der Rohe, Le Corbusier and Gio Ponti to North America. 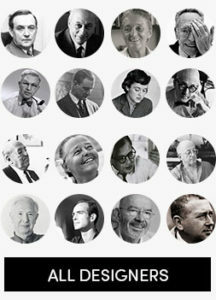 At “Architectural Forum” he was first associate editor (1935- 1943) an later consultant editor (1944-1949). He defended sometimes ferociously the modernist principles and irritated many of his colleagues who as “industrial designers” made, according to Nelson too many concessions to the commercial forces in industry. By 1940 he had drawn popular attention with several innovative concepts. In his post-war book: Tomorrow’s House, for instance he introduced the concept of the”family room”. One of those innovative concepts, the “storagewall” attracted the attention of D.J. De Pree, Herman Miller’s president. In 1945 De Pree asked him to become Herman Miller’s design director, an appointment that became the start of a long series of successful collaborations with Ray and Charles Eames, Harry Bertoia, Richard Schultz, Donald Knorr and Isamu Noguchi. Although both Bertoia and Noguchi expressed later on regrets about their involvement, it became a uniquely successful period for the company and for George Nelson. He set new standards for the involvement of design in all the activities of the company, and in doing so he pioneered the practice of corporate image management, graphic programs and signage. His catalogue design and exhibition designs for Herman Miller close a long list of involvements designed to make design to the most important driving force in the company. From his start in the mid-forties to the mid-eighties his office worked for and with the best of his times. At one point Ettore Sottsass worked at his office. He was without any doubt the most articulate and one of the most eloquent voices on design and architecture in the U.S.A. of the 20th century.